GTA V Finally Gets A Launch Trailer—But What Does it Show? Still riding the hype-spike generated by the recent coverage of Grand Theft Auto Online, the independent multiplayer component of Grand Theft Auto V, Rockstar today released the official launch trailer for the next GTA installment. We’re sitting less than three weeks away from the game’s console launch, so, unsurprisingly, no mindboggling details have come to light in this, the latest in a long line of trailers and teasers. However, the official trailer is still packed with plenty of goodies for GTA fans to latch onto. A varied cast is great and all, but it wouldn’t be Grand Theft Auto without a heaping helping of heists, vehicles, and things that go boom. 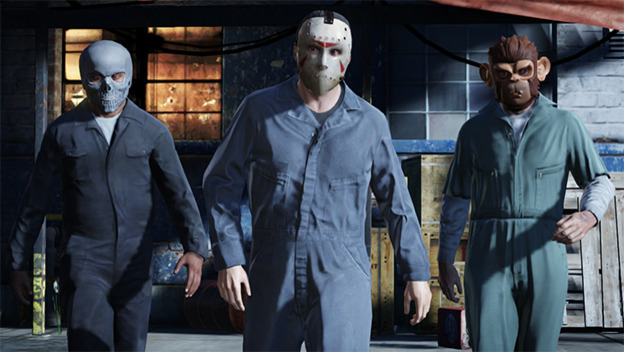 And, as the new trailer shows, GTA V has all three in spades. Michael and the gang will be attempting every job in the book, from your run-of-the-mill bank holdups to high-profile gigs with significantly higher stakes and rewards. In order to do so, the team will be packing GTA’s famously over-the-top arsenal, from pistols, to shotguns, to military-grade machine guns (which may or may not remind us of the Chain Gunner from Star Wars: Battlefront 2). Clearly, players will never be at a loss for things to steal and shoot. However, the game’s expanded archive of vehicles is arguably the most impressive addition to the tried-and-true GTA formula. Sports cars and helicopters, while enjoyably fast and destructive, are old-hat at this point, especially with the mayhem of Saint’s Row 4 still in our rear-view mirrors. This makes the fighter jet and entirely new submarine (only one piece of a long list of underwater content) that much more impressive, as the two, and whatever other shenanigans Rockstar has planned, will undoubtedly add a welcomed bit of variety to the everyday getaways and chases of GTA. Grand Theft Auto V is set to make its worldwide debut on PlayStation 3 and Xbox 360 September 17th, with Grand Theft Auto Online coming shortly after on October 1st. We’ve seen everything from specialized character trailers, to mechanic overviews and development diaries, to today’s launch trailer: Without actually getting their hands on the game, GTA fans know nearly everything there is to know about GTA V. With that said, only one question remains: How hyped are you for Grand Theft Auto V? If you’re still hungry for more GTA V coverage, head here to find out what we think the game shouldn’t do, or here to get in on the Saint’s Row 4 vs. GTA V debate.